Wasre of time. Boring. No shells. We had a great time on Morris Island. The captain and his assistant were great! Very relaxing with an opportunity to swim, explore and relax. Everyone in our group (ages 5 to 68) had a great time. The boat ride to Morris Island was relaxing and full of local history. 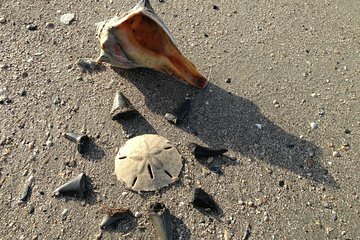 We came home with shells, sand dollars, sea glass, and sharks teeth. Our captain and guide were friendly, informative, and helpful. Bring a bag or two to carry home your treasures! Sun screen is a must and a snack in your bag will result in a perfect outing.